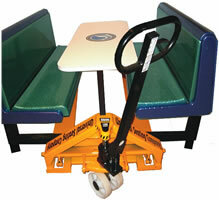 The cart has specially designed attachments to grip the frames of our booths and easily move them. In 27 years of providing booths in school cafeterias, the only complaint we received was from custodians who said that moving the heavy booths to strip and wax the floors twice a year was difficult. The cart grips the frame underneath a booth’s bench seats. We listened, and developed a Booth Lifting Cart that allows one person to quickly and easily lift a 600 pound booth and roll it to another area of the room for easy cleaning. The cart slides under the booth frame, then the booth is raised off the floor and easily moved on the large nylon wheels. This is an illustration of how our cart slides under the booth frame to lift it up. This Booth Lifting Cart is available exclusively from Food Court Design Group and we now have a solution to the only problem with using booths in the dining room. When the hydraulic cart is raised, the entire booth frame is off the floor with plenty of clearance.